Must cities choose between walking and driving? According to a survey of CEO’s and other business leaders in Washington, D.C., 99% want to ease traffic flow between the city and suburbs. However, 89% said that they would like to see walkable communities where amenities are located near residential districts. Struggle to balance these interests in the city’s transportation plan. As the Greater Greater Washington blog states, “the two forces are [often] in diametric opposition.” Usually, the things that make a place more walkable (such as extended walk signals, median refuges, and pedestrian bump-outs at crosswalks) also make it less driveable. This conundrum is most evident in Washington’s suburbs, many of which are striving to create an urban identity while bearing some of the characteristics of a suburban office park. The founder of Greater Greater Washington, David Alpert, suggests implementing congestion pricing on high-demand arterial roads through such neighborhoods. Congestion pricing is a method of limiting road use by charging drivers a toll based on the time of day. It allows those who absolutely must drive to do so while encouraging others to seek alternative modes of transportation. Congestion pricing would allow the roads to remain relatively safe for pedestrians, helping suburban communities such as Silver Spring, MD and Tysons Corner in Virginia to create great places for their residents. 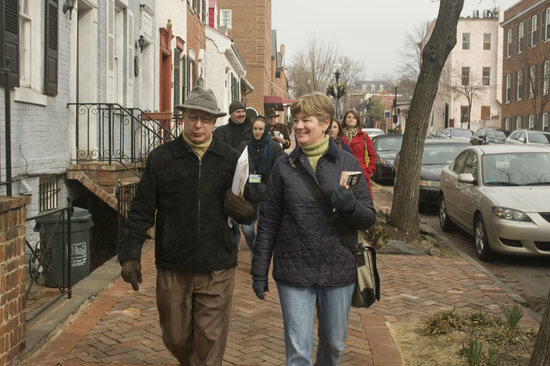 The Coalition for Smarter Growth, an organization devoted to making the D.C. region more walkable and livable, has a series of stories on their website focusing on walkable living. These short quips from Washington-area residents reveal how the region’s bicycle and pedestrian infrastructure (and sometimes the lack thereof) affect how people go about their daily lives. But with so many other transportation options available, including the Metro, Capital Bikeshare, and carshare, it’s easy to go car-free in D.C. If more people chose to do so, the region could immediately alleviate some of the traffic congestion that currently besieges its workers’ commutes.